The outfit I wore to present our Retailers Symposium last week was a donegal suit made by Dalcuore. I've liked the idea of a tweed suit for while - taking something so rural (as my mother would say, so 'Farmer Giles') and subverting its connotations with a Neapolitan make, a slimmer fit, a denim shirt, a dressy shoe etc. The problem is that most tweeds are soft and spongy, without the crispness to work as a trouser. And I fervently dislike the worsted tweeds that take away all the texture of tweed and leave only its hunting colours - greens, browns and windowpane checks. This Drapers donegal works, just about. It's still not the hardest of trouser materials, but it's no worse than a light woollen flannel, say. It comes in more versatile greys and charcoals, but the aim here was to make a country suit and drag it into the city, so I went with a brown. The black grenadine tie is darker and sharper than anything that would normally be worn with such a suit. The shirt, too, is a standard, business, plain-blue poplin, rather than a brushed cotton, Tattersall check or something more countrified. The pale-grey cardigan (which I particularly like as a colour against this brown and black) is a fine, dressy cashmere. And finally the boots are fine, thin-welted, highly polished Edward Greens. A nice brown in town. The suit itself was a good fit, particularly given we had only one fitting in London in order to get it ready for the event. But unfortunately there were a few simple mistakes with the trousers - side tabs that didn't work, French keeper set to a different waist measurement, waist itself a little too big. Issues like this are something you come to expect from most Neapolitan tailors, unfortunately. The English and French are much more consistent (and generally across nationalities you get more reliability the more you pay). The jacket, the harder bit to get right, was spot on, with just a little more shape required in the waist. You can follow the discussion on Brown in town: Donegal-tweed suit, Dalcuore by entering your email address in the box below. You will then receive an email every time a new comment is added. These will also contain a link to a page where you can stop the alerts, and remove all of your related data from the site. Do you mind me asking for the reference number for the cloth? Beautiful cloth and a good looking ensemble, but not convinced by the tie in black; a good alternative could be a vibrant rust colour. Thinking more that black in the tie and brown in the boots is too much. Good point. 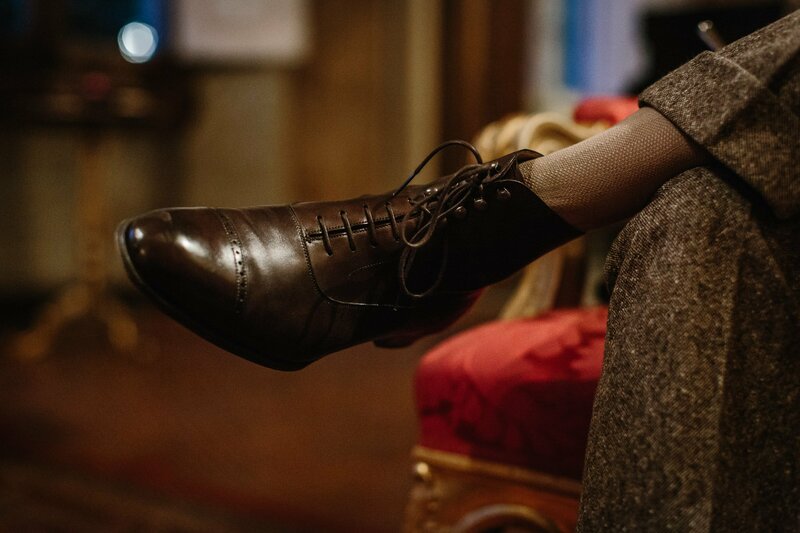 Obviously the boots would be much more subtle when standing, but I can see a darker brown oxford might be better. But that is a Ariston fabric isn’t it, not Drapers? Fantastic suit. How much do Dalcuore charge for a suit like that? I have recently met with Cristina from Dalcuore in NYC. She quoted me 3000 euros as an entry point for a bespoke jacket. The fabric was from Holland and Sherry, 906001 ( 90% wool super 110 and 10% cashemere). I repeat the quote was for a jacket only not suit. She told me that other material from Holland and Sherry would cost me 3500 and 4000 euros ( all for 90% wool 10% cashemere). When I told her about the quotes in your posts, she said that it depended upon the material and whether it was bespoke or made to measure. She said prices in your posts were probably for made to measure not bespoke? I refused to do the jacket at 3000 euros, and decided to go with Solito instead. My question to you is : Are your prices here for Made to measure or Bespoke? I am confused! Or maybe she just did not want me to be their client ! Flying to U.S. cost more than flying within Europe, which also explain why they charge even more in Asia. Would this come under “knockabout” definition? Also great to know price points! While I appreciate that the photographs that accompany these articles are intended to be engaging and represent the garment in a more naturalistic way, it would be great if we could get at least one shot showing the whole suit rather than close-ups of bits of it! Thanks Matt. Sure, I normally would and there may well be more this week from the event itself. I tend to do those shots more when it’s a new tailor and people want to a (small) idea of the fit. Simon – what is a “French keeper” please? So you have a zipper on your pants? I have all my bespoke pieces made with buttons. I like the conservative mode. And I don’t feel it too unconvenient! Do all your bepoke pants have zippers? Yes, they all have zippers. If it was good enough for the Duke of Windsor, it’s good enough for me. Also, buttons are a pain. …,even more when you’re left handed. The French bearer is normally located on the right of the trouser, closing onto the left. The hook and bar/extender go from the left over to the right of the trouser. Thus, when both are closed , they neutralise the strain which would otherwise exist on the closing and provide a neater finish. I really like the combination of colours and textures. You normally add the source of your outfit and the end of your article as I was curious the brand of your cardigan. I have also experienced similar issues with Neapolitan trouser makers in terms of the side tabs not working – something I find incredibly frustrating. I haven’t had that side tabs issue with any other Neapolitan suit, interestingly. The cardigan is from Cucinelli. What exactly means “side tabs that didn’t work” ? Isn’t that an issue you meet relatively often? I found that only a handful of tailors had access to qualitative side tabs that held the fabric well enough. The placement of those on the belt is also of key importance as it doesn’t work equally well at all depending on where it’s placed. I’ve been on the lookout for a proper side tabs supplier to order them for myself and give them for all orders, to no avail for the time being. No, to be honest I almost never have that issue. I had this issue once – in my case it was because the trousers were made of a slippery gabardine, and the tabs wouldn’t hold. The tailor fixed this by doubling up the fabric inside the side tabs. Quite a subdued review but very welcome nevertheless. Firstly it would be good to see you do a RTW Tweed review from Cordings or Walker Slater. Secondly, on the broader subject of cloth, is there ever a time when man made fibres are acceptable on high quality clothing ? I ask as I was surprised to see Incotex and Barena use man made fibres on some of their trousers and jackets . Thanks. I’m unlikely to wear tweed in those styles, but happy to comment on them at some point. Sometimes synthetics can be useful, particularly for stretch or water resistance. But I would never have it in a suit or jacket. ‘Never in jacket ‘ …. is that because it doesn’t look as good / feel? Interesting choices of combination, Simon. The suit looks to be a ‘relaxed’ style which I think nicely appropriate for tweed or at least that style of heavier cloth. I love the turnups on them, just got back to those with a pair of charcoal flannels. The cardigan is inspired -hadn’t really warmed to knitwear under tailoring probably as I had only seen some disastrous combinations previously. Personally only something I think looks good with the more casual tailoring though. It’s the tie that has me flummoxed albeit explained a little by you stating there is black in the suit cloth. That amount of fairly plain black is quite a contrast to the rest of the outfit and a bit more formal than the rest in my view. Not saying it’s wrong, just need a bit of time to digest that one. I am a terrible a loss however to go for what I would choose as an alternative – would you say as a rule that the tie should be a contrast in colour, texture etc to say, the jacket? It’s hard to give any rules for the tie choice. More that you can start simple and then broaden out in terms of options, with the broader you go the more risk there is. Black Grenadine seems to go well with the outfit. Look forward to more pictures. I think that looks great. I had a very similar Caccioppoli donegal tweed made by Graham Browne last year that I really like too though of course the make is very different. Did you have a waistcoat made as well? One other question – I have a pair of C&J Islay boots that like yours have hooks on the ankle part. I have found these a real pain to wear with anything other than jeans as the hooks seem to catch on the stitching of the trousers. Have you had that problem? Not so often, but I know what you mean, it can happen. Any chance of a few more photos, perhaps some full length portraits? I can’t get enough of this suit! Simon, do you see yourself wearing the jacket separately from the trousers? Perhaps with chinos/jeans or flannel pants? As hard as smart casual is, it offers the opportunity to really play around with things. What a great suit. I would imagine the cloth looks even better in the flesh as it would become more three dimensional than a photo allows. I would consider wearing it with a dark blue cardigan and bottle green grenadine, or even canary yellow cardie with a burgundy grenadine. I feel a commission coming on…………..
Really nice suit, fabric and the overall combination. Looking forward to a full length picture. Love to see full length picture, both front and back. Congratulations on the suit; lovely colour and texture. As suit-wearing becomes increasingly elective, I think a lot of chaps will get more joy out of this sort of suit than the duller specimens. What’s the weight of the cloth? This suit looks great albeit I reserve final judgement until we see a full length shot. I’d also love to see it with a Loro Piana Dolcevita roll neck either in grey or navy blue. I think right roll necks look fabulous with casual suits. They can look very nice, yes, though it’s worth paying close attention to the fineness of the gauge of the knit. A thin, Smedley-type rollneck requires a slightly more formal suit. I’m interested as to why you would say that when the cardigan you are sporting is clearly a very fine gauge? I’m not familiar with the Smedley product but would you consider LP baby cashmere to be too fine? I wear them with my cord suits and they look good in the city. I would perhaps wear something thicker in the country. Isn’t it more about location? The gauge is about how it is knitted – the number of stitches per inch – rather than the yarn that is being used, or the fibre in that yarn (baby cashmere is a fibre). So baby cashmere might be fine, yes, it just depends how it is knitted. It’s points like this that make me love PS. I’m now a knitting expert! But you are right – I’ve looked at Smedley and they wouldn’t work. LP certainly would. For me, it’s a much more louche look with this sort of suit. Much better than a shirt and tie. Do you find there’s less of a benefit to having high laced boots like your E.G. Balmorals made bespoke since the imperfect fit of RTW can be compensated somewhat with the lacing? Never thought a black grenadine would work…but it does! Do you mind me asking where the cardigan came from? I have been trying to find something similar for ages. A couple of other small comments, I have all my trousers made with button flys, saves on the potential embarrassment of flying low. But that is the wonderful thing about bespoke we can all indulge our preferences. I saw that Walker Slater has been mentioned above, I live in Edinburgh so their shop is relatively handy for me, but I don’t like their style. It’s very country. Tailored trousers with mistakes…how this comes about and is passed by is always a mystery to me. This would never happen with a Japanese tailor, or at least would be corrected on delivery. As with shoes too (I`ve read quite a few of yours are never perfect at first finish), I guess the European mentality is that even if the price is high, the customer is the one that chose and therefore comes second best. In Japan or tailors abroad, customer is king and their satisfaction and perfection is paramount. At that price point, I would expect no less than perfection. Thats the only way to keep the standards high. Interesting commission Simon but all we can guage is the cloth and your boots. Trying to assess cut, style and silhuoette is impossible from your crouched, seated position. You know images are an occassional weakness on PS (especially full length) and these really don’t support the purpose of the accompanying text – to properly describe and illustrate the commission. Stylish shots of the advertising genre have their place but need to be balanced with more informative images – it can be done (see Instagram; Gandy, The Armoury, Joshua Kane, Casely-Hayford etc.). I know symposium shots will follow but as these are often ensemble/group shots they may not give the detail to the suit which I’m sure it deserves. What kind of pocket square are you wearing in the photos? Regarding the brown in town aspect, I have a question regarding the famous “no brown in town” which I believe is still important in some specific London contexts. I am moving to london at the end of the month in order to try and make a living our of my passion for which the offer in Madrid is limited to say the least. I was therefore wondering if this “no brown in town” rule is exclusive to banking (or maybe not anymore? ), or if it might be a faux pas for applying to any kind of position within the city. Thanks Javier. I would say that in offices where a dark suit and tie are worn most days (mostly just lawyers and the occasional bank) then black shoes would be by far the safest option. But those offices are very rare these days, so in any other situation you would be absolutely fine in brown. These kind of sayings and reputations are usually far better known by people outside the UK than by people in it! Simon, i just initated the process of tailored odd jacket in a green donegal tweed. I was wondering about the lining and tended towards having made a quarter lining, i.e. Only upper back and sleeves. I was recommended to have lining on the sides as well, which I am unsure about. I noticed you seem to have a preference for unlined sides in your tweed jackets. Could you share a couple of words on your decision (warmth, vestibility etc)? Much appreciated and always a great pleasure to follow tour posts! Coming late to this thread but wondering about fit issues when wearing a sweater (even a thin one) under a bespoke jacket. My Italian bespoke clothing naturally fits like the proverbial second skin and doesn’t leave much room for a sweater. In the event pictures I notice you do indeed manage to button the jacket around the sweater. Do you build in more room in the jacket in anticipation of wearing a sweater, and if so wouldn’t that affect the fit without a sweater? In general, thin knitwear should be fine – unless the jackets do fit you very tightly, which isn’t what I’d recommend either. Thanks Simon. 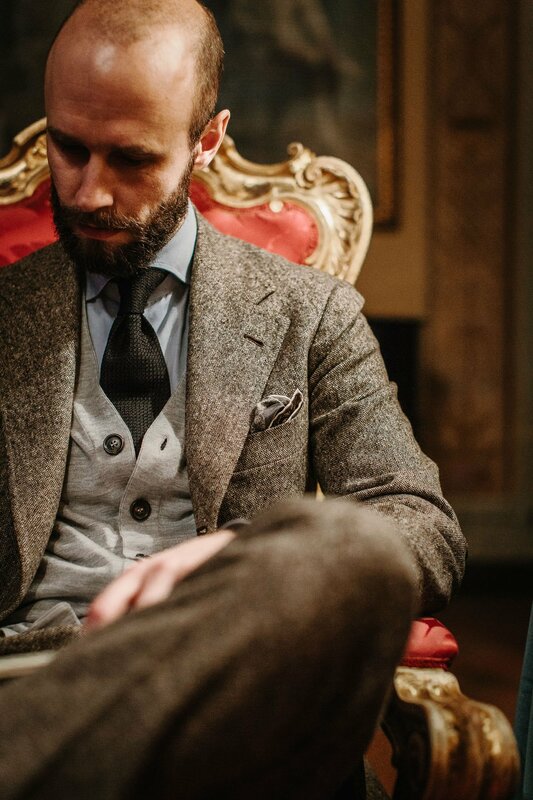 I’ll be in Naples in February and planning to get some sort of tweed suit made at Rubinacci; hoping I can find something rare in their vintage collection. I’ll be sure to discuss sweater fit with Mariano. For the same reason as with tweed, do you not like worsted flannels? I imagine worsted flannel as a way to have a work suit whose jacket can be worn oddly and casually. Wrong? Worsted flannels generally give up most of the things that make flannel nice (texture, handle) in favour of weight. You can wear heavier trousers – stick with woollen flannel. In general, a flannel jacket can’t be worn separately. And a worsted flannel one definitely can’t. For a flannel jacket to work separately, it needs a lot of help from things like: soft construction, casual colour, details like patch pockets and contrast buttons. Helpful. Thank you. So a flannel suit ought to be made with woollen flannel. Any more criteria (weight, density, brand,….) in order to avoid the trousers’ fabric to shine/lustre and lose shape at the seat? I do like the idea of a donegal suit mid way that can commute between town and country. How have you found the turn ups with boots? I know the origin of turn ups would make sense for this, and yet whenever I wear boots with turnups it does not look right to me. Also if one was to take such a suit for a walk in the country it is more material to get wet. Also are their any other Donegal tweeds you could suggest? I quite like it with boots, to be honest, particularly as a turn-up will usually be slightly shorter in the back, and therefore less of an issue with boots pushing up the trouser and making them seem long. W Bill’s donegals are worth looking at. How different is this cloth from your other donegal jacket from Rubinacci? Extremely subtle color mix for the overall attire. I may even try to copy you on that one. Simon, I was looking at the lighter weight P&H Thornproof, but would this be an example of your worsteds masquerading as tweed? 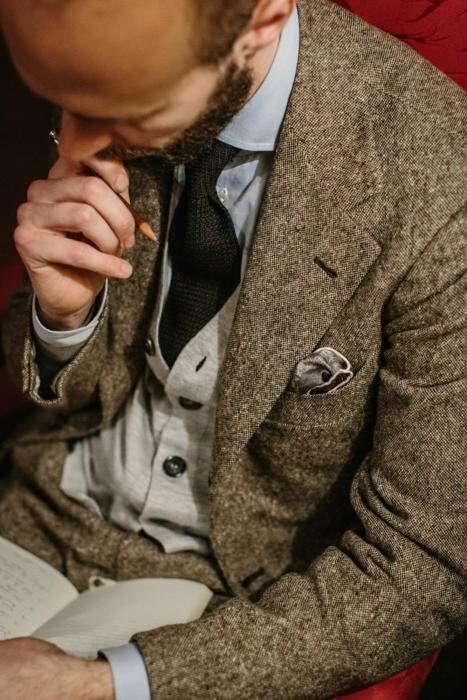 Any recommendations for a tweed suit at 13-15 oz which would give trousers that held a crease and wouldn’t wear out too fast? Thanks. Hey Simon what kind of tie would you recommend in color, design and weave to wear casually with tweed type jackets? As a newbie. It is maybe a stupid question. As Dalcuore is very famous nowadays, it is probably difficult to get an appointment, even on there Trunk Shows. Are there any other tailors with a similar cutting style as Dalcuore?